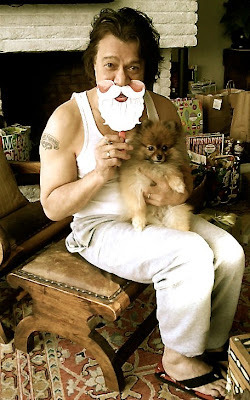 Eddie Van Halen is spending the holidays at home in Los Angeles. A new photo of the guitar icon with his Pomeranian named Kody has surfaced on Kody’s Facebook page (here). 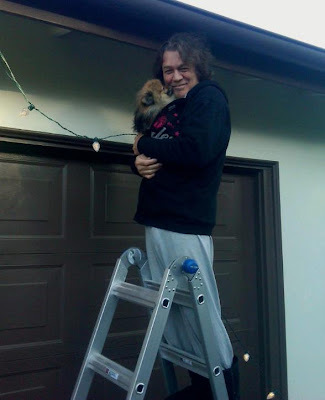 A photo of Eddie putting up the Christmas lights was posted earlier this month (see it below). Eddie has been keeping a low profile over the past few months as he recovers following surgery this summer for a severe bout of Diverticulitis. The illness caused caused the postponement and eventual cancellation of a series of Van Halen concert dates across North America, and the postponement of a series of shows in Japan that were scheduled for November – they’ve since been rebooked for June 2013. Van Halen dominated the 2012 hennemusic Rock News Awards.